Chicago’s Michigan Avenue is one of America’s majestic boulevards, located in America’s premier city for architecture. As the nation’s center for large conventions and railroad and airline travel throughout the 20th Century, Chicago has been home to some of the most architecturally stunning hotels in America, if not the world. The existing early 20th Century hotels—and a couple of buildings originally created for other uses and recently retrofitted into hotel use-- offer compelling insights into timeless architecture, the elegance of a bygone era, and the possibilities of historic preservation. 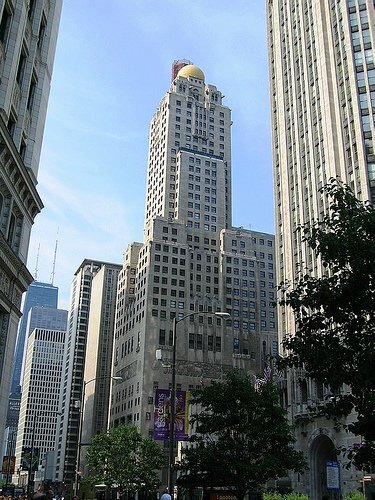 For 1.2 miles from Roosevelt Road to Randolph Street, the west side of Michigan Avenue lines the expansive Grant Park, forming a street wall of impressive architecture, most of which is from the first half of the 20th Century. Grant Park is often referred to as Chicago’s front yard, composed of 319 acres surrounded by fine architecture and Lake Michigan. The northwest corner of Grant Park was completely renovated from 1998 to 2004 to become Millennium Park, home of the iconic Cloudgate sculpture, a Frank Geary bandshell, fountains and peaceful gardens. North of Randolph Street for 1.1 miles, Michigan Avenue becomes a canyon of swanky shops, high rise offices, apartments and condominiums-- capped by the venerable Drake Hotel and Oak Street Beach on its north end. The following eight Michigan Avenue hotels run from the Hilton Chicago at 720 S. Michigan Avenue to The Drake Hotel at 140 E. Walton Avenue. The total distance in both parts of the tour is 1.9 miles. To proceed from the end of Part One of the tour to the beginning of Part Two, walk north on Michigan Avenue from the Auditorium Building (Roosevelt University) at 430 S. Michigan Ave. to the Carbide and Carbon Building (Hard Rock Hotel Chicago) at 230 N. Michigan. The distance is 8 ½ blocks, or .7 miles. To cross fewer streets, get a better look at the buildings, observe a better angle on the Michigan Avenue street wall, and see Millennium Park up close, you may want to walk on the east side of the street closer to Grant Park. You can cross back over to the west side of the street at E. South Water Street for the next destination at the start of Part Two of the tour. Part two of this tour is from the Carbide and Carbon Building (Hard Rock Hotel Chicago) at 230 North Michigan Ave. to The Drake Hotel at 140 East Walton Street. The total distance is 15 blocks, or 1.1 miles. The entrance of the Carbide and Carbon Building from Michigan Avenue. Detail of the upper floors of the Hard Rock Hotel Chicago. Although not built as a hotel, the transformation of the former Carbide and Carbon Building into the modern Hard Rock Hotel presents a fine model for architectural historians and urban planners seeking to repurpose valuable architectural masterpieces for practical modern use. 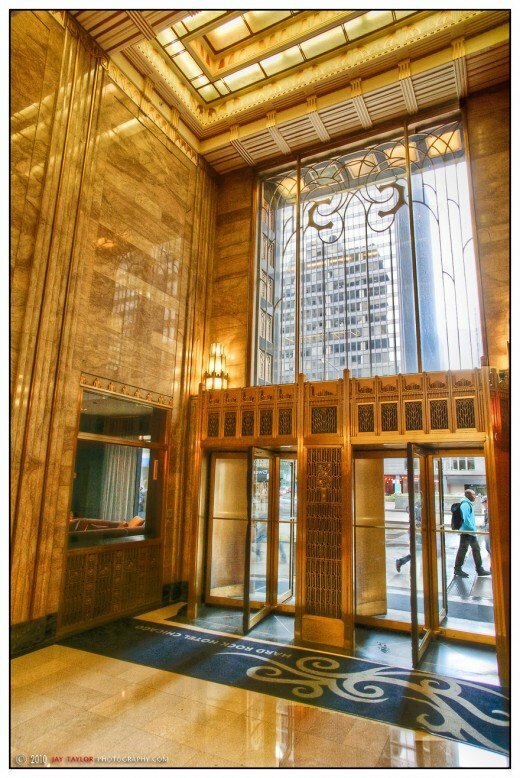 Built in 1929 as the headquarters for one of the companies that would eventually become the Union Carbide Corporation, the ebony and gold Art Deco masterpiece quickly became a favorite building of Chicagoans. 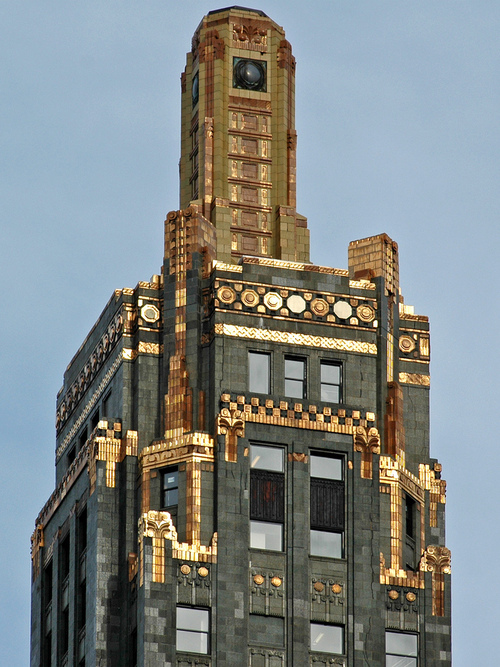 Designed by Burnham Brothers architects, the polished gray granite of the base gives way to dark green-gray terra cotta rising in an elegant column topped by a 50-foot tower trimmed in gold leaf. 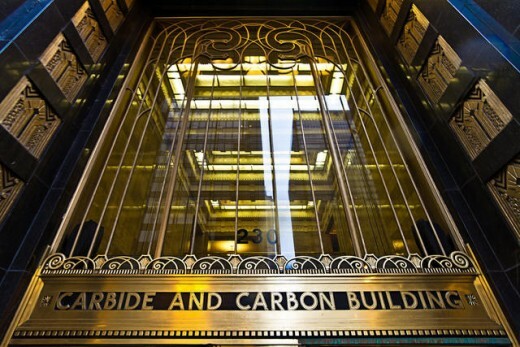 Set apart from most of the other buildings of the period in Chicago, the Carbide and Carbon building stood apart as an elegant, dark column. For decades, most Chicagoans thought the building was actually black. Many years of soot and grime from coal locomotives, cars, and industry accumulated to give the building a patina that darkened the deep forest green of the building’s surface. The actual color was a curious revelation to many people when the building underwent a painstaking, five-year renovation at the turn of the 21st Century. Many sources have reported the architects designed the building to resemble an enormous champagne bottle, and effect you can see somewhat clearly from directly across the street on the east side of Michigan Avenue. Whether the intent was deliberate or not, there is a resemblence, and it would have been quite an amusing tale about a building designed during Prohibition. Containing 37 stories and rising 503 feet tall, the building was designated a Chicago Landmark in 1996 and opened as the Hard Rock Hotel in 2004. The October 2010 edition of Chicago Magazine ranked the building at #33 among Chicago’s Top 40 most magnificent buildings. Built in 1929 as the Medinah Athletic Club by the Shrine Organization, this 42-story, 471-foot tower clad in Indiana limestone and topped by a Moorish dome would be the iconic structure at the center of the skyline silhouette in most other cities. Yet on Chicago’s Michigan Avenue, surrounded by the Tribune Tower, Wrigley Building, and other stately masterpieces of early 20th Century architecture, it’s just part of the crowd. Adding to its relative anonymity is the fact the building had many ups and downs over the course of its life. Completed just before the stock market crash and Great Depression, the building served as an Athletic Club for only five years before the Shrine Organization went bankrupt in 1933 and eventually lost control of the building. It languished through the 1930s and early 1940s as a residential building before being reborn as the Continental Hotel and Town Club in 1944. The original interior was even more ostentatious. In the tower of the original athletic club was a miniature golf club with babbling brook water hazards on the 23rd floor. There was a shooting range, gymnasium, bowling alley, archery range, boxing arena, and 440 guest rooms. The lavish, junior Olympic-sized swimming pool on the 14th floor was an engineering marvel for its day, frequented by Johnny Weismuller and Esther Williams. 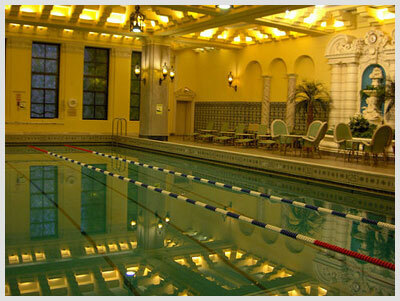 The AIA Guide to Chicago calls the pool a rival of the Hearst Castle in San Simeon. The Sheraton Hotels owned and managed the building through most of the 1950s and 60s before the Radisson Hotels took over. In 1961, a modern north tower of 25 stories was built attached to the original building. Radisson passed the hotel on to private ownership in 1983 when it became the Hotel Continental. By the time I spent three weeks at the hotel in late 1985, the rooms in the north tower were considered the prime guest rooms, and the original building had deteriorated badly from deferred maintenance. The 14th floor pool was still in operation, but visibly neglected, shabby, and a bit sad, especially considering its rich history. InterContinental Hotels and Resorts bought the property in 1988 and immediately began a very thorough and well-researched renovation. The north tower opened as the Forum Hotel in early 1989, and the south tower opened as the Intercontinental Chicago in March 1990. In the late 1990s, a second renovation merged the hotels into one facility with a new entrance under the InterContinental name. The magnificent renovation of the original building employed period documents from the Athletic Club to re-created interior design elements of the period. 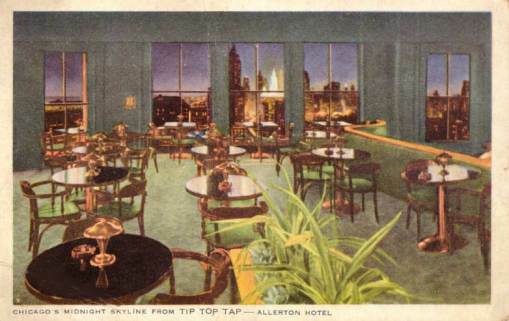 The hotel facilities were upgraded to evoke the glamour of an earlier age and rival any four-star hotel in the city-- especially the bar and lounge featuring top-notch live cabaret performers overlooking Michigan Avenue. 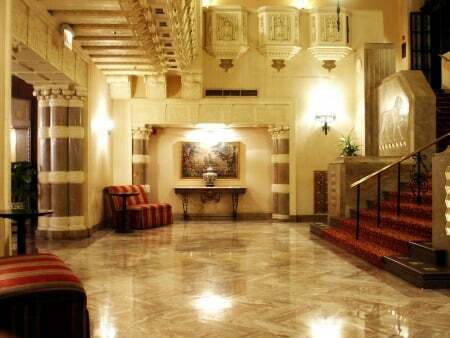 The grand lobby and mezzanine with two horseshoe-curved staircases is one of the great hotel lobbies in the city. Detail of the rooftop and intricate brickwork with the iconic Tip-Top Tap sign. 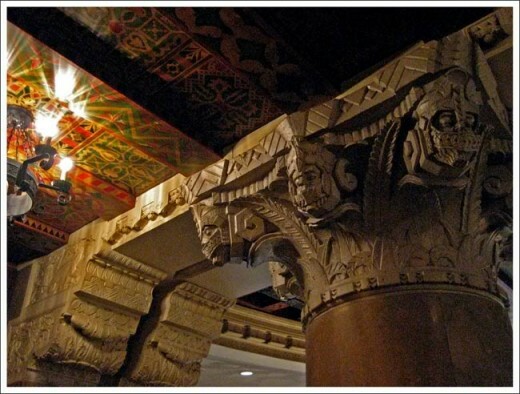 Built in 1924 as part of a New York-based chain of apartment hotels for single men and women, designers Murgatroyd and Ogden created an Italian Renaissance jewel in the middle of the Magnificant Mile. 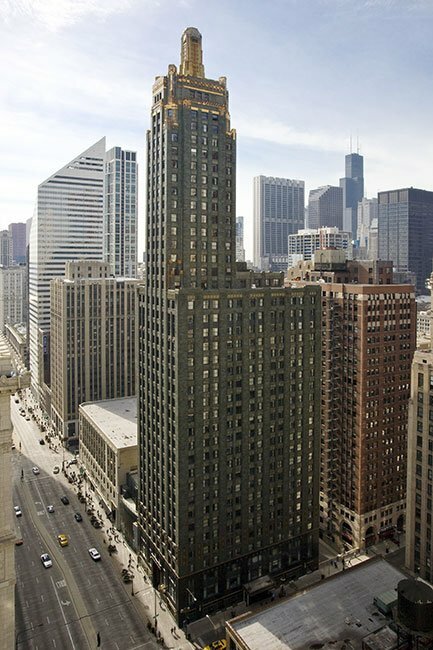 The prominent setbacks on the building’s upper floors was a reaction to a 1923 Chicago zoning ordinance mandating setbacks to curb the rectangular, massed buildings that blotted out sunlight in high rise corridors. But the elegance of their expression and the unusual sloped roofline topped by an octagonal tower added to the building’s pleasing profile and ultimate longevity. The building rises 370 feet from street level and contains 25 floors. Built at a cost of $4 million, it had 14 floors of small rooms for men and six floors for women. 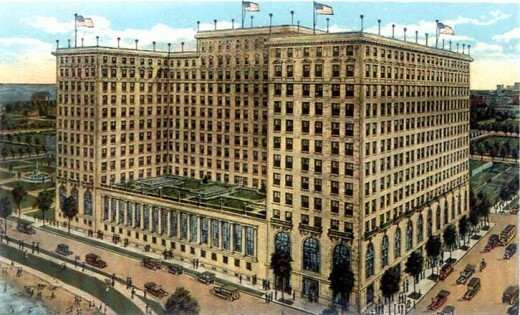 The hotel contained approximately 1000 rooms, and featured amenities such as a library, a solarium, organized social and sporting events, and an in-house magazine. In the 1940s, the facility switched to a more traditional hotel format as postwar travel boomed once again. One of the key features of the building is the enormous “ghost sign” near the roof on the south-facing exposure. Heralding the Tip-Top Tap, an elegant rooftop lounge and club popular in the 1940s and 1950s, the sign has become a distinctive part of Chicago’s character even though the club itself closed in 1961. TheTip-Top Tap was replaced by The Cloud Room in 1963, which became the site of the daily nationally-syndicated broadcasts of Don McNeill’s Breakfast Club. 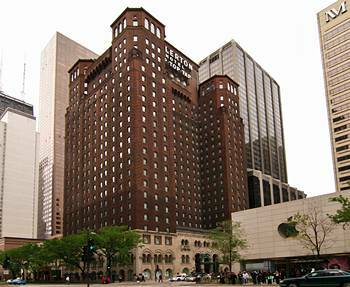 The Allerton Hotel was declared a Chicago landmark in 1998, and soon closed entirely for a thorough, top-to-bottom $60 million renovation. The once-faded, slightly shabby hotel opened in May 1999 as the Allerton Crowne Plaza Hotel, and immediately received praise for its return to mid-20th Century elegance. Even the Tip-Top Tap sign got a much-needed makeover—it can be seen close up from the Renaissance Ballroom in the former location of the Tip-Top Tap and The Cloud Room. The wood-paneled 2nd floor bar echoes the tradition of the legendary lounge as Taps on Two. In November 2006, the AllertonCrowne Plaza was sold to the Chartres Lodging Group for $70 million. 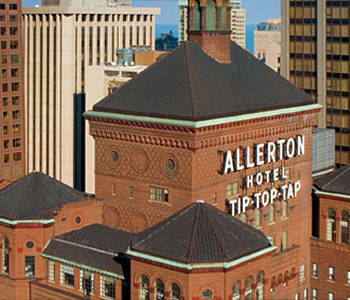 After a re-branding, it was opened on February 2, 2007 as The Allerton Hotel. The Drake hotel was opened in 1920 by a pair of 2nd generation Chicago hoteliers, as Chicago’s Near North Side emerged as a fashionable new address. Designed in the Italian Renaissance style by the firm of Marshall and Fox-- the same firm that designed the Drake Brothers’ other major hotel (The Blackstone, included in Part One of the tour)—the land and the financing of The Drake came from some of Chicago’s earliest retail and meatpacking families. The Drake contains 537 bedrooms and 74 suites, a six-room Presidential Suite, several restaurants, two ballrooms, and the Palm Court—all overlooking Lake Michigan and Oak Street Beach from the end of the Magnificent Mile. The 13-story, 142 foot high building is designed in an H shape to provide more windows , air, and city and lake views. 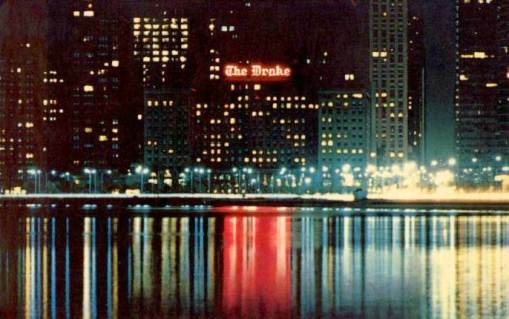 The Drake’s distinctive sign in pink neon faces north as a familiar sight to southbound motorists on Lake Shore Drive. The hotel's most prominent public spaces-- the lobby, ballrooms, meeting rooms, restaurants, and lounges-- are located on the second and third floors while the ground level is devoted to small retail shops. 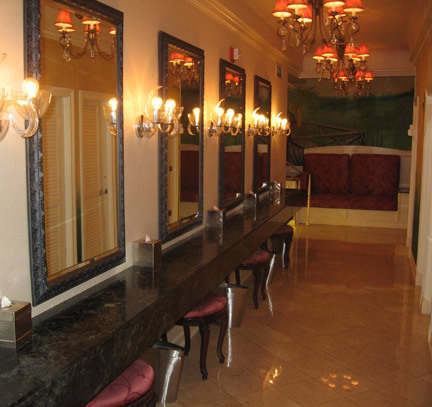 In 2009, the Ladies Powder Room in the elegant Palm Court earned a nomination as one of America’s Best Restrooms, thanks to its chandeliers, sconces and palm tree murals. Famous guests at the hotel over the years have included Winston Churchill, George Gershwin, Bing Crosby, Katharine Hepburn, Lionel Barrymore, Anwar Sadat, Groucho Marx, Walt Disney, Salvador Dalí, Prince Charles and Princess Diana (on separate visits), Amelia Earhart, Queen Elizabeth & Prince Philip, Helmut Kohl, Bob Hope, Sammy Davis Jr., Sophia Loren, Margaret Thatcher, Jack Nicholson, and Bill Clinton. 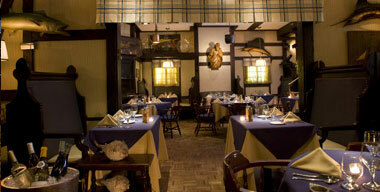 Newlyweds Joe DiMaggio and Marilyn Monroe reportedly carved their initials into bar of the historic Cape Cod Room. 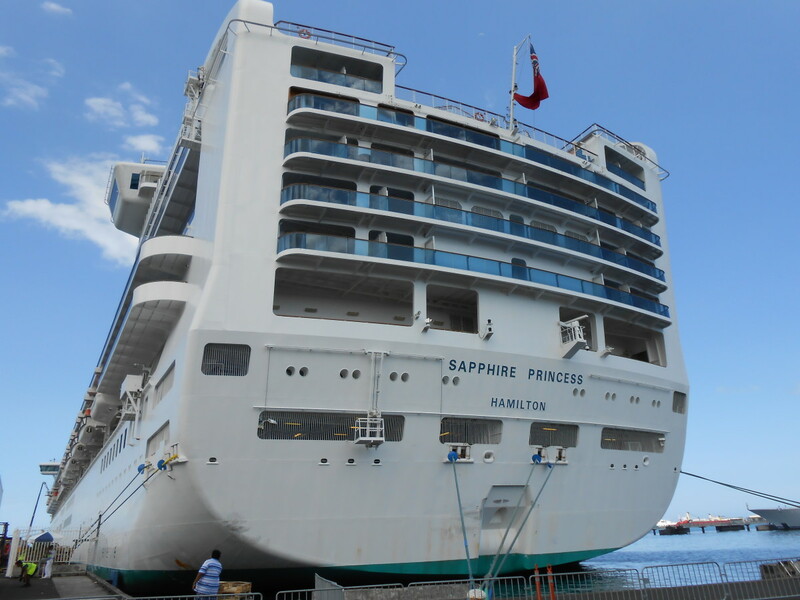 The corridors and guest rooms underwent a five-year, $45 million renovation from 1998 to 2003, and $15 million more was poured into the property in 2005 to add additional amenities. If you missed it, click here for Part One of the tour.